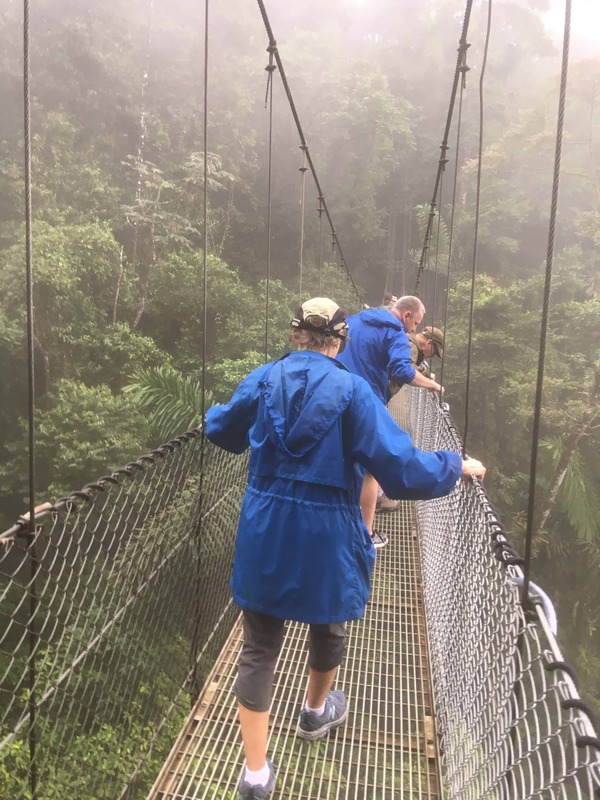 I stepped carefully onto the swaying suspension bridge that would take me 300 ft. across a stretch of misty northern Costa Rican jungle. Towering trees dripped with moss and dangly, snake-like vines. The man ahead of me carried impressive photography equipment. His heavy steps made the bridge bounce wildly and sway. Thoughts of cables breaking or a sudden wind gust causing us all to fall flashed through my head. I gripped onto the steal railings. To make matters worse, the photographer had stopped to take pictures. I couldn’t pass him on the narrow bridge. I was stuck here. I didn’t want fear to ruin my chance to experience the jungle at the same level as birds, sloths, and monkeys. I needed a distraction to take my mind off my fear. A swinging grapevine caught my attention. I’d imagine myself joining Tarzan and Jane for a swing through the jungle! As the photographer changed a lens, I noticed a huge kapok tree with wide branches. It would be the perfect structure for a sturdy two-story tree house. The distant waterfall would ensure I’d have enough drinking and bathing water. Although I didn’t see banana, papaya, guava or nut trees, I guessed they were nearby. As for clothing, I could stitch these huge palm leaves together. I’d tuck a white orchid behind my ear and swing through the jungle with style. The photographer had finished and we continued on. Seconds later, a sudden rain shower made him frantically stop to cover up his equipment. I threw up my raincoat hood and told myself not to panic about pausing midway on a swaying bridge some 150 ft. above the hard ground. Desperate, I pictured Tarzan again. A colorful bird flitted past making me wonder if he and Jane had eaten bird eggs. Surely they couldn’t build a cooking fire in their treehouse. Had they eaten them raw? The photographer resumed walking. Now that the bridge was wet, I worried about my shoes not gripping. What had Tarzan and Jane done for shoes? I’d seen huge ant hills, a tarantula poking its head out of its nest, and a poisonous viper snake. Imagine being barefoot and stepping on any of those! With my raincoat hood helping to funnel sounds, the rat-a-tat of a woodpecker, the creaking of the suspension bridge, and the distant howler monkeys sounded intense. I wondered what jungle sounds would be like at night. Had any of the Tarzan and Jane films showed them swinging through the jungles after dark? Once back home I’d search on Youtube for episodes. “Great job, hikers,” the tour guide said. I blinked. I’d reached the end of the bridge and the cloudburst was over. I threw back my hood. “Only six more bridges to go,” the guide said. “No problem,” I said, knowing Tarzan would help me. I turned to face the jungle wondering if anyone would notice if I thumped my chest. This looked like an amazing adventure! Your website is gorgeous.